There is new pembroke in the Kennel! Meet ourQueen Margo! She is not exactly "new" as soon as she is the daughter of ourMeggy from the third litter and her official name is Zamok Svyatogo Angela Zhulietta! Today on the All-Russian dog-show "Arta-Winter-2006" our daughterZamok Svatogo Angela Gardeya won champion's class, received CAC and became BOS, Ch.RKF and Ch. RFLS under judging of R. Rothner! Our congratulations to her owner Larisa! 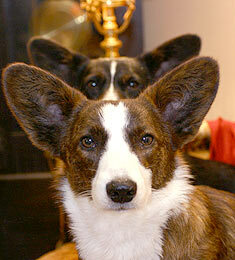 National speciality " Moscow Corgi Show - 2006"
Our congratulations to Zhozef's owners! Today on the International dog-show "Russia 2006" our daughterZamok Svatogo Angela Gardeya won intermediate class and received CAC under judging of Zoran Brokovich (Serbia and Montenegro)! Our congratulations to her owner Larisa! The page ofour Meggy sonwelsh corgi pembrok Dzhozef (Zamok Svyatogo Angela Zhozef) was added to our website. Look at this handsom small gentleman!